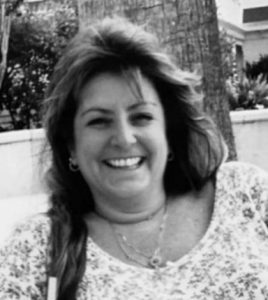 Deborah “Debbie” Lynne Farago Richardson joined the Lord and her mother in Heaven on Jan. 14, 2019. She was born June 6, 1962, in Ballwin, Mo., the third of four children to Karl and Nancie Lee Farago (nee Knoll). Debbie was raised in Waterloo and after graduating from Waterloo High School in 1980 she moved to Miami, Fla. It is there that she gave birth to her daughter, Cherish, in 1990. Shortly after losing her home to Hurricane Andrew in 1992, Debbie moved to Summerville, S.C. in 1993, where she lived until her death. Debbie was proud to be called “Gammie” by her granddaughter Lakelynn. Debbie was an excellent cook and there wasn’t a friend of hers who hadn’t enjoyed her extraordinary cooking. When she wasn’t cooking a feast, she enjoyed spending time at the beach or tanning poolside. Debbie had an infectious laugh which often followed one of the many pranks she liked to pull on her friends and family. There is nothing Debbie wouldn’t have done for her friends or family and all who came in contact with her were blessed by her presence. She will be greatly missed… until we meet again. She is survived by her daughter Cherish Farago, granddaughter Lakelynn Farago and husband Roy “Bubba” Richardson all of Summerville, S.C. Also surviving are her brother Darren Farago, sisters Denise Holm and Dawn (Mitchell) Rubemeyer, father Karl Farago, step-son Luke (Christy) Richardson, and numerous nieces, nephews, cousins, aunts, uncles, great-nieces and great-nephews and step-grandchildren. She was preceded in death by her mother Nancie Lee Farago; paternal grandparents Joseph and Ella Farago (nee Fedl) and maternal grandparents Bernard and Lorraine Knoll (nee Dell).